"The repossession by women of our bodies will bring far more essential change to human society than the seizing of the means of production by workers." 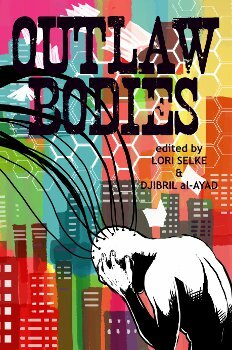 Outlaw Bodies is an anthology published by our parent imprint Futurefire.net Publishing and guest co-edited by Lori Selke. In anticipation of a new job, I went on a shopping expedition the other week. The results included three pairs of black trousers, officially women’s but as unisex looking as these things get really, which I needed to have taken up, two shirts and a knitted vest (men’s) and a dress, striped at the top with a dark skirt. A successful, if expensive, haul. It’s always been this way for me, wearing clothing commonly identified with almost the full range of the gender spectrum. As a small child I fluctuated with apparent ease between the smocked, floral dresses my grandmother made, and my favourite brown corduroy dungarees. Even as a teenager, when I wouldn’t have dared shop for men’s clothes, I still scored some items from a batch donated to my brother by a member of his archery club.